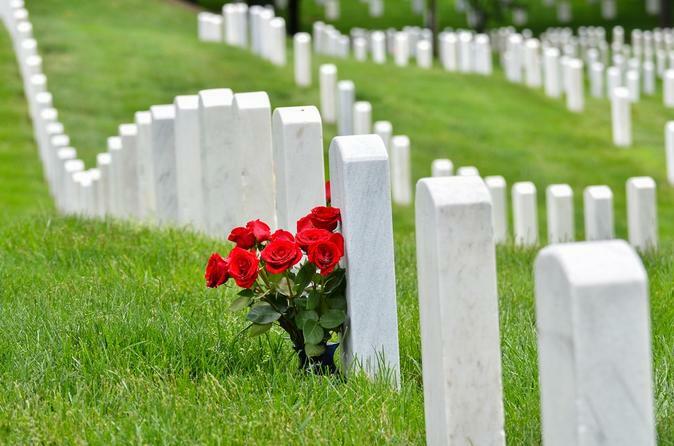 Visit Arlington National Cemetery and explore some of the most famous memorials around Washington, DC on this private, 3-hour sightseeing tour. At Arlington National, witness the famous Changing of the Guard at the Tomb of the Unknowns, then stop at famous landmark locations like the Arlington House — the Robert E. Lee Memorial, the President John F. Kennedy Gravesite, and more. Finish with a look at some of DC's most popular sites, like the Vietnam Veteran's Memorial. This educational and entertaining tour begins with a visit to Arlington National Cemetery for the ceremonial Changing of the Guards at the Tomb of the Unknowns. Also, see the Arlington House — the Robert E. Lee Memorial, the President John F. Kennedy Gravesite, and more. Afterwards, visit the Marine Corps War Memorial and the US Air Force Memorial for a great view of the United States headquarters of the Department of Defense and the Pentagon. Then finish with a short ride across Arlington Memorial Bridge into DC and a visit to the Korean War Memorial and the Vietnam Veterans Memorial. Snacks and beverages are permitted on the van, but not at the memorials. Pictures of the Pentagon are not permitted for publication. This is an interactive tour. All questions are welcomed. THIS IS A 3HOUR TOUR PLUS PICK UP AND DROP OFF.